Below is a list of GPlates-compatible data files that can be loaded seamlessly in GPlates. The feature data are available as .gpml (GPlates Markup Language), .dat (PLATES4), .shp (ESRI Shapefile) and .xy (long, lat with header record) formats. Data by the EarthByte Group are licensed under a Creative Commons Attribution 3.0 Unported License. When using GPlates and the sample data to make figures for publications, we recommend citing the original data sources as indicated below. For users of GPlates 1.5, you can find the complete archived Sample Data from this link. Below is a list of GPlates-compatible present-day rasters and time-dependent raster images that can be loaded seamlessly in GPlates. The raster data are available as a series of jpgs. The EarthByte Phanerozoic reconstruction, published in Wright et al. 2013. These static polygons represent the boundaries of present day plates as well as presently preserved palaeo-plate boundaries. The polygons are broken up by age over the ocean floor based on the Müller et. al. (2008) present day agegrid. Plates that have been created or destroyed in the past are not incorporated into this model. The plate polygons are based on the EarthByte 2009 plate model. This dataset is compatible with the EarthByte present day coastline file. 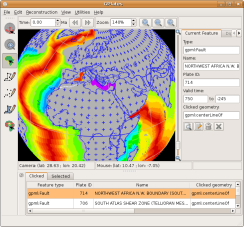 The file can be loaded into GPlates, other GIS software (such as ArcGIS, PaleoGIS, Quantum GIS, GRASS GIS, SAGA GIS, etc) as well as technical computing programs such as Matlab. Click here for more information. These polygons represent continuously closing plates from 140 Ma to the present. Unlike the present day polygons listed above, these polygons dynamically change shape as the plate boundaries evolve. Plates that once existed in the past are incorporated. The plate polygons are based on the EarthByte 2007 global plate model. This dataset is best used for any global plate kinematic analysis, as boundary layer input into mantle convection software such as CitcomS and can be used to assign plate identifications to your dataset. The limitation of this dataset is its resolution, with only 40 plates existing during the last 140 Myrs. The plate polygons are available as GPML (GPlates Markup Language) files, which can be manipulated and translated to other formats with GPlates. The data are also available as static polygons in 1 Myr intervals. Click here for more information. Boyden, J.A., Müller, R.D., Gurnis, M., Torsvik, T.H., Clark, J.A., Turner, M., Ivey-Law, H., Watson, R.J. and Cannon, J.S., 2011, Next-generation plate-tectonic reconstructions using GPlates , in: Geoinformatics: Cyberinfrastructure for the Solid Earth Sciences, Keller G.R. and Baru, C., eds., Cambridge University Press, p. 95-114. Gurnis, M., Turner, M., Zahirovic, S., DiCaprio, L., Spasojevich, S., Müller, R. D., Boyden, J., Seton, M., Manea, V.C., and Bower, D., 2012, Plate Reconstructions with Continuously Closing Plates , Computers and Geosciences, 38, 35-42, doi:10.1016/j.cageo.2011.04.014. Williams, S., Müller, R.D., Landgrebe, T. C.W., Whittaker, J.M., 2012, An open-source software environment for visualizing and refining plate tectonic reconstructions using high resolution geological and geophysical data sets , GSA Today, 22, no. 4/5, doi: 10.1130/GSATG139A.1. A Phanerozoic plate motion model, digital coastline file, and continental outlines, ready for use with GPlates were made available with the publication of Wright et al. 2013 . This plate motion model is different from the Mesozoic and Cenozoic plate models developed by the EarthByte group, including models by Müller et al. (2008) and Seton et al. (2012). Instead, the Phanerozoic plate motion model accompanying this paper is based on the relative plate motions from Golonka (2007) and the updated absolute motions of Africa (using the GAD rotations) from Torsvik and Van Der Voo (2002). The complete Paleobiology Database (as of October 2011) is included in the supplementary material as tab delimited files, and the converted shapefiles are available for collections between 100 and 0 Ma. The Palaeogeographic Atlas of Australia is also provided in shapefile format, and has been converted into GTS2004. Additionally, the workflow and selected results from our data mining process is provided here.